This method is completely for testing and learning purpose only. Do not use this method on production environment or permanently for long term. You can’t get the all features of Mac OS Xfrom this method as how it works on Apple hardware. We always recommend to buy Apple hardware to run Mac OS X. Also, few users keep on asking about their Apps development and Xcode support on virtualized hackintosh. Frankly, I do not know whether these all will work on this platform, if it works, you are lucky. 1) Hardware Virtualization Technology (VT) enabled processor. I do not fully recommend VT pypasser (to skip this check) tool which is included in this download. 2) Pre installed VMware image with few tools. VMware unlocker and darwin.iso are important. 1) Download ‘Mountain Lion 10.8 Retail VMware Image’ from owner’s site or direct torrent link here. 3) Check and make sure your physical computer processor supports Hardware Virtualization Technology (VT). Read our previous guide about how to use VT checker tool and confirm it. 4) Use VMware unlocker (which will be available on same extracted location) and patch the existing VMware workstation 7 or 8 series. Use the correct version of unlocker. 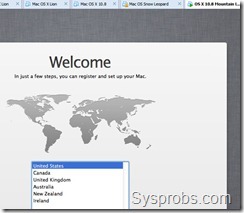 Read more abouthow to use VMware unlocker to get Mac OS X guest support. After the patch, make sure you are getting Apple Mac OS X option as shown below. 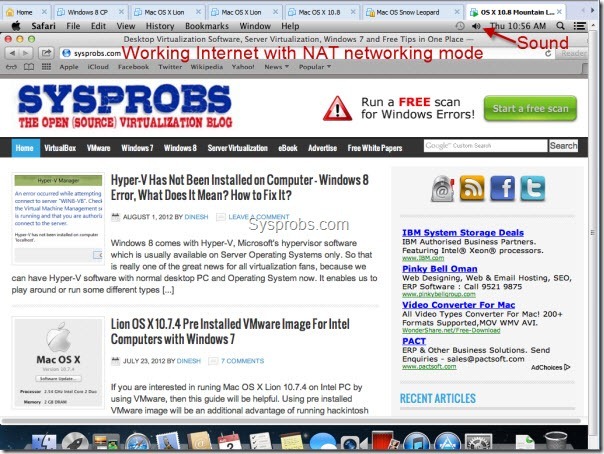 5) Once the step 3 and 4 are succeeded, open ‘OS X 10.8 Mountain Lion.vmx’ from extracted location through VMware workstation ‘File –> Open’ menu. 6) That should open the pre installed Mountain Lion retail VMware virtual machine. Before powering on, you can modify processor and RAM settings depending on available resources on physical computer. I have increased the RAM to 2GB and number of processor cores to 2 as I have core2duo physical processor. 7) Now power on the virtual machine. If all settings are correct, the Mac OS X 10.8 virtual machine should start with initial setup screen of Language settings as below. That’s it, we are almost done. After completing all initial settings (you can skip few too), you should land on mountain lion desktop without any issues. I recommend to take a snapshot now before proceeding further. Network and sound worked out of the box without additional installations or settings. 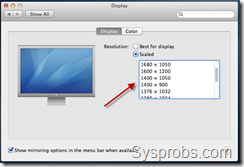 To get more screen resolution sizes, VMware shared folder and slightly better performance, we need to install VMware tools on mountain lion virtual machine. 8.) To install, load the darwin.iso file to virtual machine’s CD/DVD drive. Darwin.iso located at same extracted place. Once it is loaded to CD/DVD drive, the virtual machine will automatically detect and load it on desktop as below. Double click and run ‘Install VMware Tools’ application. You may need to enter your password and select the disk to continue the installation. 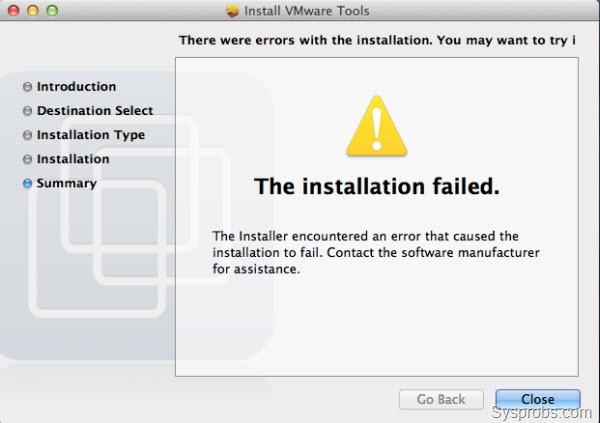 For some reasons, VMware tools installation failed on Mountain lion virtual machine, but nothing to worry. Press close and restart the virtual machine manually. 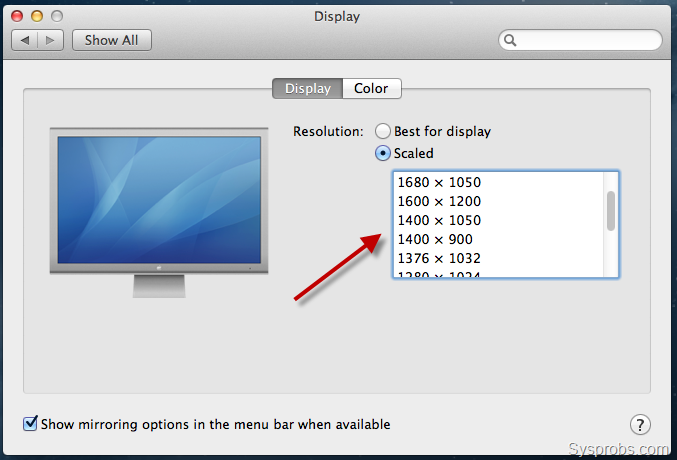 9) After virtual machine is restarted, you will find more screen resolutions under display settings. Also, the full screen mode (from VMware menu bar) will work now. Few users reported that drag and drop of files between Mac OS X guest and Windows host is not working even after VMware tools installation. Yes, it is not working and we can’t complain about it, because VMware is not officially supporting Mac OS X virtualization on non Apple hardware. So, we need to live with it. But, if you like to transfer files between Mac OS X guest and Windows host frequently without any types of networking connectivity or network sharing, then you can use VMware shared folders feature. This will work only after VMware tools installation. 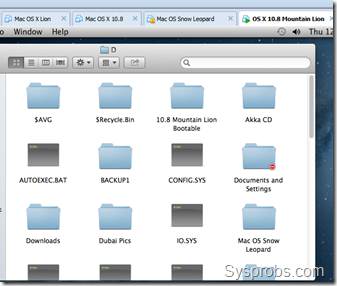 You can access specific folders or partitions of Windows 7 host OS thorough VMware shared folders from Mountain Lion guest OS. That will enable the file transfer back and forth easily. It is nothing to do with networking or network file sharing, it is completely a different technology. To set it up, go to virtual machine’s settings and Enable the folder sharing first. Then, add the partition or folder of Windows host. Wait for some to mount this drive or folder inside Mountain Lion virtual machine. You will find a new drive under computer on OS X. By opening the drive you can access the hosts’ shared drive or folder. Depending on the mode you selected (with read-only or not), you can save the data too. This is really fast and easy to transfer files and folders between Mac OS X 10.8 guest andWindows host machines. Enjoy and play around with 10.8 Mountain Lion retail version on VMware!.